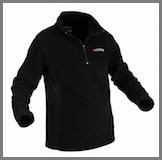 X-System Women's Heavyweight Fleece Pullover. Shaped for a feminine fit, this exceptionally soft and comfortable 320 gram polyester fleece pullover contains our X-System anti-odor technology which wicks away moisture and allows for breathability. Occasionally for reasons beyond our control, errors may occur in pricing, specifications, descriptions and quantities. We reserve the right to make adjustments in pricing, descriptions and quantities available without notice.